Maple has been on my mind a lot lately and I have been looking for new ways to enjoy it. While I was going through my bookmarked maple recipes I came across one for a maple cheesecake from Not Quite Nigella and I had to make it immediately. Cheesecake has to be one of my favorite desserts and combining it with the flavour of maple sounded like a great idea! 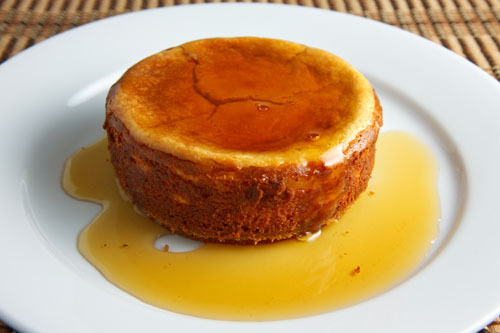 I started out with my standard cheesecake recipe and pretty much just replaced the sugar with maple syrup. An equal amount of maple syrup is not as sweet as sugar but I knew that I was going to drench the cheesecake with more maple syrup when I ate it so I did a straight up replacement. My apartment was filled with the an amazing cheesecake and maple flavour while it was baking and that built up my anticipation even more. So much so that I ate the first one when it had cooled just enough to eat. The maple cheesecake drenched in maple syrup was so good! The still warm from the oven cheesecake was nice and light and fluffy and creamy and good! 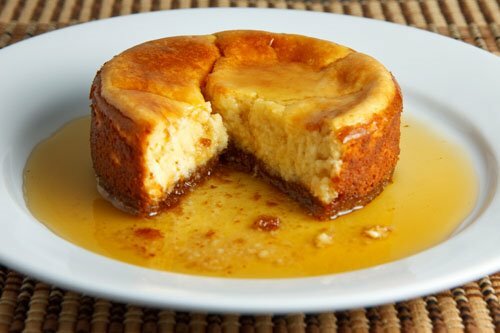 The maple syrup soaked into the crust and into the cheesecake infusing every mouthful with intense maple flavour. It was pure delight! I ate the second one cool from the fridge and it was more dense and creamy the way I normally like my cheesecakes and it was just as good. I served the second one with some maple whipped cream for even more maple enjoyment. Mix the graham cracker crumbs, maple syrup and butter. Press the mixture into the bottom of two 4 inch spring form pans. Mix the cream cheese and maple syrup. Bake in a preheated 325F/170C oven until it is set, about 45-60 minutes. Note: This recipe makes enough for 2 4 inch spring form pans. Triple the recipe for an 8 inch spring form pan and quadruple the recipe for a 10 inch spring form pan. Oh Kevin, this look sooooo good! I am bookmarking it. Thanks for sharing. Yikes! That looks so delicious and decadent I’ll have to save it for when I finally have the willpower to starve for a week beforehand. You must have crazy metabolism to make TWO of these. What a nice little cheesecake – perfect size for date night. you’re killing me with all of your amazing maple posts! this sounds so, so delicious!! mmmmm. This looks so good. I will be making it soon. maple cheesecake is SURELY the way to go!! I like that it makes only 2! Then I won’t eat the whole dang thing! I have never made cheesecake! This sounds and looks divine! I love that you go on ingredient binges – I do the same thing! And maple is a lovely ingredient to explore. YUM. Wow. This looks incredibly delicious. I really want to take a bite of this now. A perfect little size too! YUM. I’m a huge fan of maple, this sounds awesome! OMG. I have a cheesecake weakness. Kev, when last did you have your cholesterol tested????? You really know how to pull out some calorie bombs. Yummee!!!! Stole your pic again, let me know if you need anything changed! Kevin this cheesecake look really cute and sweet!! I notice you like maple a lots!! Looks delicious, and proudly Canadian! I gotta get me a 4 inch springform pan – what a perfect size! How do you do it, day after day? It’s just amazing. And this cheesecake is going to be in my dreams tonight! I love maple but impartial to cheesecake. Yet, this dessert looks too good to miss! I love cheesecake. I love maple syrup. I am drooling. Gosh….I have to make this ASAP! ooooh i love the minis! and the maple dripping off of the cheesecake–that looks fantastic. Wow, awesome flavorcombination, it looks so very delicious, phenomenal! Maple is such a yummy flavor, this look especially yummy! I seriously would have sat and ate half the darn cake. It looks unbelievable! All I can say is… YUM! Maple syrup instead of sugar sounds incredible! Thanks for the idea! ohh yummy, that looks delish Kevin! Anyway – what’s up w/the maple whipped cream? Did you use maple syrup in place of powdered sugar, or in addition to? What’s the ratios? This looks absolutely incredible. I love the idea of making 2 mini cheesecakes. Looks just like something my dearly beloved would scarf down in a heartbeat! Love your maple posts of late. The inside of that cheesecake makes we wish I could grab a spoon and dig right in! Looks sooooo good! LOL! I’m terrible about digging right in and not waiting for anything to cool. Okay, this is the second one of your blogs that caught my attention 🙂 I LOVE real maple!! And i love cheesecake! thanks! I’ve made something similar before, and yes, I can vouch for the sweet, heady aroma that would fill the room. I love cheesecake and this looks so good! Wow, looks so good!!!! What a great recipe. Thank you for sharing. Another fantastic recipe! Can’t wait for another occasion to bring dessert! You love your maple! Never would’ve thought to put it in cheesecake, but we love that. yum!! this looks too good, i love cheesecake- any type and maple sounds delicious! I imagine this was delicious Kevin with all of that wonderful Ontario maple syrup. One thing I miss about living in Ontario is the Maple Festival. Maple cheesecake! That must have tasted amazing! KT: For the maple whipped cream I just add about a tablespoon of maple syrup to the cream and whip it as normal. Maple cheesecake…Who would have thought!!! I am so drooling here Kevin. This is going in my “must try file”. Lovely pics as always, thanks for recipe. Nice – and distinctly Canadian eh? this look delish..i can’t believe how few ingredients it requires. i’ll definitely make this! OOOOH Kevin, you just made my day!!!! MMMMMMMMMMMMMM….This is pure indulgence!! Cheesecake is my favorite dessert. Love this recipe. My dad makes his own maple syrup, which is a real treat for me. Looks great.. One of my favorite cheesecake flavors. I don’t like many desserts but that looks GOOD! Oh. My. Word. You’re killing us here! Truly inspired. I love that this is 2 portions! Thank you..Maple Syrup is a plenty here right now..I appreciate this!